My wife recently reshared this video from +FCKH8 on Facebook featuring children and teens from #Ferguson on the subject of racism and white privilege. I actually didn't watch it until another friend had commented on the sharing from "Young Conservatives," who criticized the video for playing the race card, hypocritical claims, blame-shifting, and opportunistically "only" giving nearly 40% of the cost of the t-shirts they were selling to an organization fighting racism. One of the most common reactions to "stop being racist," that I've seen is the declaration, "I'm colorblind. I don't see race. I treat everyone equally." I guess I get the point - this is probably often said with the best of intentions, but I believe its ignorant and naive. It doesn't matter if white (and/or majority) people want to declare racism dead, if black (and/or other minority) people still believe they're experiencing racism. The best (because it was the hardest) lesson I've learned in my eight years of marriage is that the intentions or rationality of your actions and words matter less to someone else than your tone and the way they perceive your actions and words. "Perception is reality," my wife would calmly remind me later, after the hurt had subsided. To say to your students that the color of their skin (and their experience in that skin) doesn't matter to you or isn't at least a consideration in the way you build relationships or consider relevance for your lessons is to belittle a part of their identity. 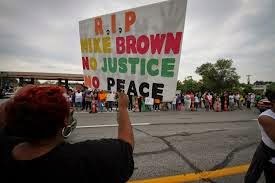 If your students identify with Mike Brown because he looks like them, then they identify with his story, too. You don't have to understand it, you just have to feel it. Listen to it. Let it happen. This rings true across ethnicities. One of the least culturally responsive things I've done in the classroom occurred my 2nd year in summer school. I had about a dozen kids in an Algebra 1 class, I think consisting of all but one being African-American. Something I was proud of in that summer course was figuring out how effective making my kids take brain breaks could be. If the kids spent a good chunk of time on-task, they would get to nominate a song to be played while they did NO math for the duration. My white student was kind of disconnected from the school community in general, but the day I finally saw him feel a part of that class was on one of the last days of the session, when I forced a nomination out of him and we listened to some of his music. It happened to be "white" music (AC/DC), but the point was that in the name of being culturally responsive to the majority of the class, I burned the minority. Treating every student the same will always leave some students disconnected relationally. I never asked him directly, but even from observing his kid's demeanor, I could tell that his perception was that who he was didn't fit in with that classroom most of the summer. Here's what I think you have to understand if you feel offended by this video - as long as some of your students perceive that the educational (and real world) experience will be different for them because of their race, you have a responsibility to at least acknowledge that racism might still be "a thing."